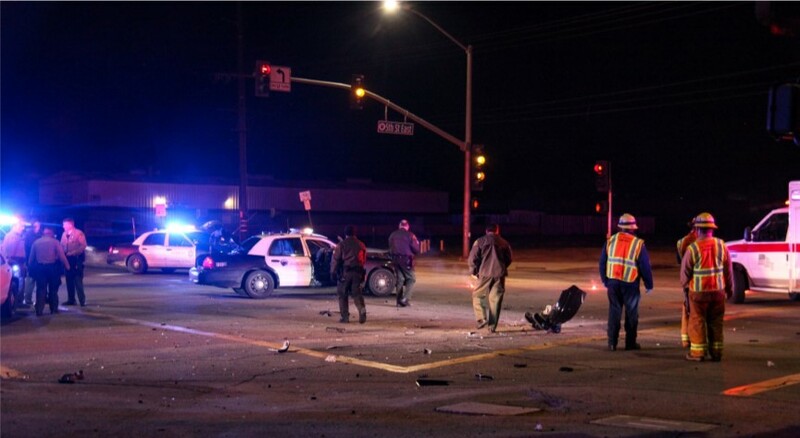 PALMDALE – A Los Angeles County sheriff’s deputy was hospitalized late Wednesday night following a two-vehicle crash in Palmdale. It happened around 11:30 p.m. Wednesday, Feb. 6, at the intersection of Avenue R and Fifth Street East, according to Deputy Marvin Crowder of the Sheriff’s Information Bureau. The deputy, whose name was not released, was en route to back up another deputy when he collided with another vehicle. The deputy’s cruiser sustained major front end damage and the other vehicle sustained minor front end damage, officials said. The deputy was taken to a hospital with non-life threatening injuries and the woman driving the other vehicle was treated at the scene and released, officials said. The circumstances of the crash are still under investigation. 3 comments for "LASD deputy involved in two-vehicle collision in Palmdale"
The Los Angeles Sheriff Department has, without a close second, the worst driving record of any department in Los Angeles County. The Antelope Valley is especially bad. They drive way too fast, especially when using red lights and siren, and in an extremely irresponsible manner. The Vehicle Code allows exception from normal driving rules when driving to an emergency with red lights and siresn, but does not excuse deputies from driving responsibly. The same day as the accident, a few blocks west of the location of this accident, a deputy driving at a very high rate of speed, passed me on the far left side of the road at Ave R and Tierra Subida, then turned right to go north on Tierra Subida, completing the turn on the left side of Tierra Subida, then continuing north on Tierra Subida, endangering anyone that may have been driving on Tierra Subida. The Sheriff administration is responsible for allowing this kind of irresponsible driving, and should put a stop to it. They only have to look at the Fire Department and ambulance drivers to learn how to drive responsibly to an emergency incident. Both entities never blast through an intersection at full speed, and they proceed cautiously when violating traffic laws, such as going through a red light or stop sign. The sheriff deputies drive like maniacs. Check the county records for accidents involving county vehicles if you doubt what I’m saying.